UK based Niklas Zennstrom’s Rán, a 72-footer from the design board of the noted German-based naval architects Judel-Vrolijk, was launched in April this year. While conditions in this year’s Rolex Fastnet Race favoured the larger boats, Rán sailed an impressive race to win overall. 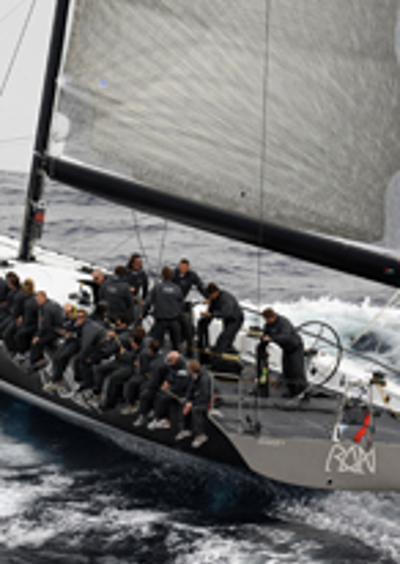 The crew of Rán is a veritable who’s who of international offshore yachtsmen including Volvo Ocean Race veterans Tim Powell (skipper) and Steven Hayles and America’s Cup sailors Adrian Stead, Andy Hemmings, Richard Bouzaid and Richard Meacham. Following the Rolex Fastnet Race Rán returned to the Mediterranean to win the Mini Maxi Division 00 of the Maxi World Rolex Cup in Sardinia in September, beating Neville Crichton’s RP71 Alfa Romeo 3. Once the crew arrives in Sydney mid December, Rán will compete in lead up events the SOLAS Big Boat Challenge and Rolex Trophy Rating Series.